Uganda’s walk-to-work is currently destined for failure, because it has so far failed to meet the minimum standards required for success. 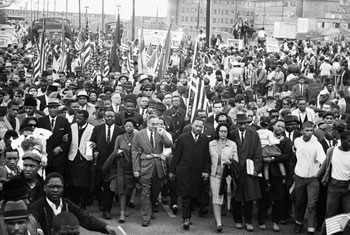 Let us take an example of the 382-day Montgomery Bus Boycott – one of the largest and most successful non-violent mass movements. In pre-1955 Montgomery, Alabama, USA, Jim Crow laws made it easy to separate blacks from whites in every area of life. However, because bus and train companies couldn’t afford separate cars, both races had to occupy the same space. The solution was to reserve specific areas on a bus for whites under the City’s code, which also gave bus drivers the ‘powers of a police officer of the city while in actual charge of any bus for the purposes of carrying out the provisions’ of the code. On De cember 1, 1955, Rosa Parks, a 42-year-old black woman boarded a bus to go home from work. Rosa was ‘physically’ exhausted on this particular day. She took a seat in the first of several rows designated for blacks. A white man boarded the bus and found all the ‘white’ seats full. The bus driver followed standard practice and told Rosa to move further towards the back of the bus. 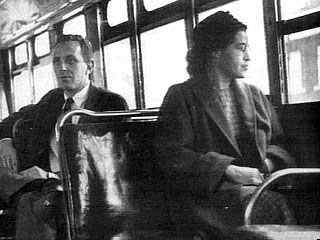 Rosa refused to give up her seat, and was arrested and convicted of violating the laws of segregation. The National Association for the Advancement of Coloured People (NAACP) organised a one-day boycott of the City’s buses for 5th December in protest of Rosa’s arrest. Blacks were encouraged to stay home from work or school, take a cab or walk to work. The boycott was highly successful. On 5th December, a group of black local leaders formed a Montgomery Improvement Association (MIA) and elected Dr. Martin Luther King as their leader. The MIA believed that Rosa’s case provided an excellent opportunity to take further action to create real change. 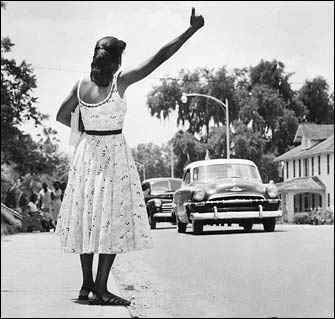 The MIA encouraged a longer boycott and also used the courts to fight the case for an end to desegregation. The boycott continued. Some people car-pooled. Others rode in blacks-operated cabs. Most of the estimated 40,000 black commuters walked, some as far as 20 miles. Because blacks accounted for about 75 percent of Montgomery’s public transport traffic, the boycott posed a serious economic threat to the bus companies and a social threat to white rule in the City. The boycott faced strong resistance. Some segregationists retaliated with violence burning black churches and attacking black leaders’ homes. The black taxi system’s insurance was cancelled. King got round this by getting insurance underwritten by Lloyd’s of London. Blacks driving cabs were frequently arrested for minor traffic violations, and blacks were arrested for violating an old law prohibiting boycotts. On November 13, 1956 the U.S. Supreme Court ruled that the segregation law was unconstitutional. With the bus companies and downtown businesses suffering financial loss and the legal system ruling against them, Montgomery City had no choice but to lift the law requiring segregation on public buses. The blacks in Montgomery started using the buses again on December 21st 1956. Rosa suffered hardship as a result. She lost her job. Her husband lost his after his boss forbade him to discuss his wife or their legal case. They were unable to find work and eventually moved to Detroit, Michigan. What lessons could Uganda’s walk-to-work have learnt from Montgomery for a successful campaign? The common cause here is the ‘heat’ being felt particularly by the ‘have-nots’ from the escalating food, fuel, etc prices. Uganda’s kamunyes and buses are owned by the ‘haves’ who simply pass on fuel price increases to the ‘have-nots’. It is a kind of class segregation, which cuts across all political parties. This is evidenced by Bernard Mujasi’s 14/04/2011 statement in Monitor, of his willingness to mobilising NRM supporters and well-wishers for the same cause. Walk-to-work could punish the haves’ incomes with some spillover-effects on to the government. Unfortunately, party politics and mob action have (been allowed to) infiltrate(d) the campaign – it is being turned into a political party opposition/mobs cause! The fact that mobilisation is more or less at opposition MP level basis, is itself testimony of lack of organised leadership and of its political party-orientation. Is there any organisation that can claim ownership of the campaign? If it is there, who is its leader? Where is the co-ordination coming from? Has alternative cheaper transport been organised for those unable to walk, those who won’t walk, or those who might prematurely be tempted back to public transport? Who is providing legal support? If there is a legitimate common cause that cuts across a cross-section of people, then there should be grounds to also use the courts to fight for the cause. Has this course of action been considered? It is only a few days into the campaign and there are already several fatalities. From what I have read in the media, the campaign is characterised by indiscipline – retaliation and exchange with the forces. By doing that, the campaigners are giving the forces reason to treat them as unlawful mobs. Due to the level of indiscipline, I won’t be surprised if the next story is about looting. Is there a solid well established strategy or could it be true, as some media articles have stated, that the opposition is just after grabbing news headlines? For how long are the leaders, let alone the people willing to walk-to-work? How determined are the people to make the campaign a success? Will they walk-to-work when it rains? Are people ready for self-sacrifice – remember Rosa and husband lost their jobs, and eventually had to leave Montgomery! Uganda’s Walk To Work, might have inspired Wall Street Protests, but not only that, it has reached the former boss- spreading to London Offshoot.